Did you know containerizing really is a word? I promise I didn’t just make it up. I double checked the dictionary just to be sure. In fact, it’s one of my favorite words ever because the action of containerizing is such a passion of mine. I’m so addicted to the high of it. There is just something so rewarding about making more fit into a space by using a few carefully selected containers. I could do it for hours. Okay, I have done it for hours, and it never gets old to me. There are just so many possibilities and configurations and the best part is no one way is right or wrong. If you are able to find what you need right when you need it, if you’re able to maximize the space available to you, if everything has a home and you stick to what you can afford then you are on the right track. 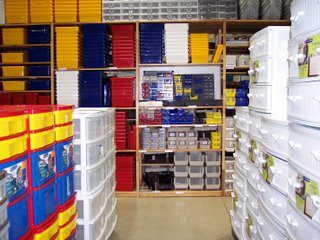 I know it can be overwhelming though, especially at this time of the year when stores are featuring organizing containers galore on their shelves. This one is a biggie. The lure of all those bins in the stores is powerful. They carry with them the hope of an organized life and so you rush right out to stock up without first considering your need for them. Now you’re probably wondering, “Well, how do I know what I need?” You’ll be able to determine that by first completing all the other steps in my organizing PROCESS. That includes planning out your project along with sorting and purging. These steps are hard no doubt and why many people just want to bypass them. Don’t. They are important and necessary to the PROCESS because by the time you get to the containerizing step you’ll have a very good idea of what you need to contain what remains. And remember, the more you purge (which costs nothing by the way), the less you need to find storage for! So often people don’t pay attention to the space they really have available to them. They figure that if their space is full they must then just need more space. What we should be thinking — and what would be painfully clear if we had established limits and boundaries — is that we just need less stuff. Let’s take my cookbooks for instance. I have a designated space for them on one shelf in one of my bookcases. That is the space I have set aside for them based on the space I have available in my home. I have established that to be the boundary and limit to my cookbooks. When that shelf gets full, I don’t then start piling the books up on the floor as I get more. I’ve exceeded my limit and therefore need to reign in my over consumption by purging out the excess or making some tough choices about what else I could part with in order to make room for them. And because all of that takes work it definitely makes me think twice about what I buy in the first place. Be creative. Look for unused nooks and crannys that could double as storage. For instance, it drives me crazy that there is so much wasted space above the top shelf in a closet. In our old house I had my husband add an additional shelf at the top of each of the closets, then with the use of some baskets I had storage for items I didn’t necessarily need daily access to. So often people think they don’t have enough room but with some realistic purging and a little creativity you will be surprised at the storage you can find. Containers do NOT need to cost much money. They certainly can, but they don’t need to. You can find containers for ANY budget. 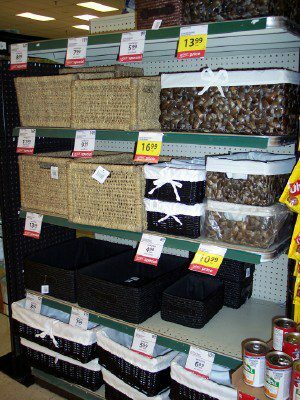 My favorite place to shop for containers and baskets is the dollar store. Since I mostly use these bins in drawers, cupboards and closets, they don’t necessarily need to look pretty; they just need to be functional. In fact, cardboard boxes such as tea boxes and tissue boxes work amazingly well in drawers just by cutting the tops off. If I didn’t use these baskets in my drawers everything would be just thrown into one big jumbled mess and I’d never be able to find anything. 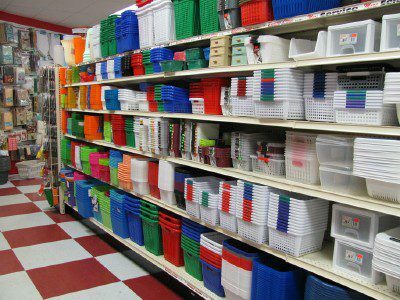 A picture of my local dollar store….many of these containers are a dollar or less! One of my favorite containerizing tricks is to re-use products in ways other than what they were originally intended. For instance a microwave stand doesn’t just have to be for a microwave. Check out this post I did on other ways to put an inexpensive microwave stand to use or even multiple ways to use a thread holder. I’ll be honest and tell you that I do have a surplus of small inexpensive containers that I keep on hand ready to go. I have a special designated home for them tucked away in my laundry room. It is nice to be able to “shop” my supply when I’m in the middle of a project without having to rush to the store. Many of us probably have a selection of containers in our home that we could use so be sure to “shop” your house first before rushing out to buy new. 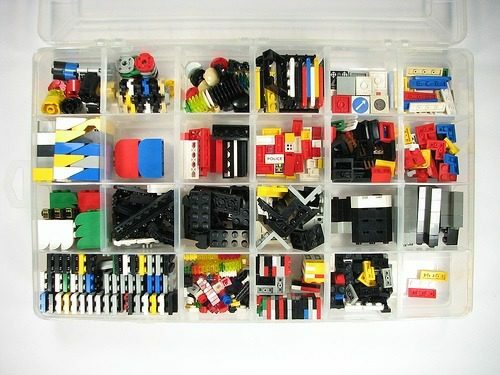 How do you use containers to help you organize? 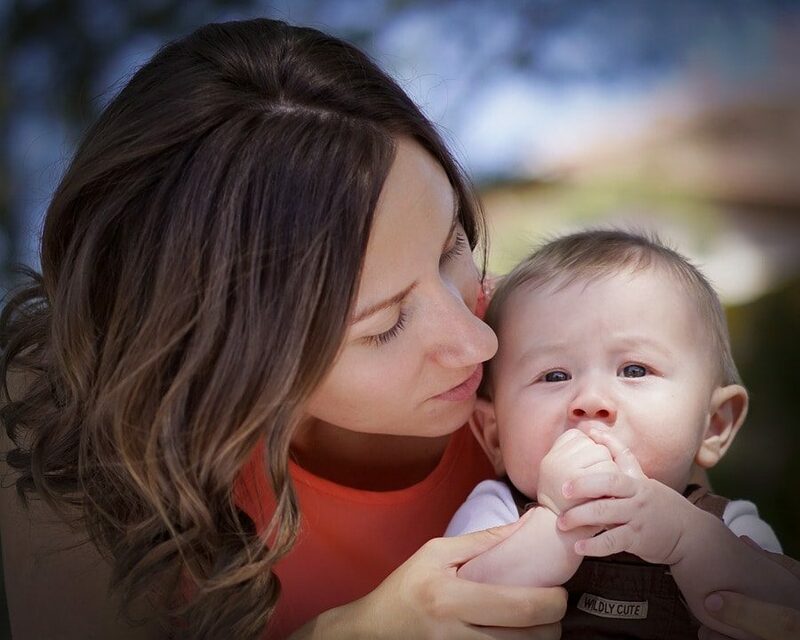 Laura is a wife and mother to three great kids, lives in Alberta, Canada and is an addict of all things organizing. She blogs regularly at I’m an Organizing Junkie, and is the author of Clutter Rehab: 101 Organizing Tips & Tricks to Become an Organization Junkie and Love It!